DiaMedical USA’s Hill-Rom Hospital Bed and Hill-Rom parts are factory refurbished and guaranteed to be the lowest price. Every bed comes standard with a new foam mattress and 1 year warranty. Choose from a variety of refurbished Hill-Rom hospital beds including the Hill-Rom 835, Hill-Rom Advance 1105 hospital bed, Hill-Rom Advanta P1600 hospital bed, Hill-Rom Affinity P3600 birthing bed, Hill-Rom CareAssist hospital bed, Hill-Rom Centra 850 hospital bed, Hill-Rom Critical Care 892, Hill-Rom P1400 Century Plus, Hill-Rom Sim Lab Starter Suite, Hill-Rom TotalCare P1900 hospital bed and Hill-Rom VersaCare P3200 hospital bed. 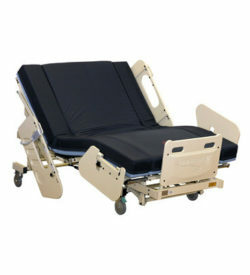 Each of our Hill-Rom hospital beds are economical with the lowest prices guaranteed. With Hill-Rom hospital beds in most medical facilities, buying from Hill-Rom can get costly incredibly quickly. Trust us at DiaMedical USA to save you money and get you the highest quality hospital beds possible. SA1387 TOP CANE & SCREWS-HD S.R.